The relationship between bisphenol A (BPA) and diabetes remains controversial. This study aims to investigate whether serum BPA level could predict the 5-year incidence of type 2 diabetes (T2D). A nested case–control study was performed among Chinese who participated in the environment, inflammation and metabolic diseases study (2008–2013). 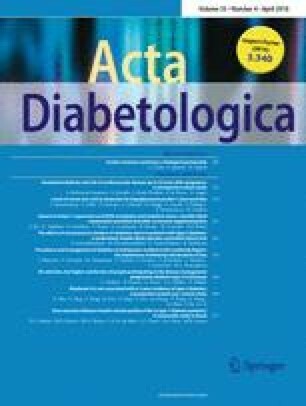 Of the 3510 subjects who were free of diabetes, 232 subjects developed diabetes during the 5-year follow-up. Cases and controls were matched for age and gender by a ratio of 1:1. Homoeostasis model assessment was used to estimate basal β-cell function (HOMA-β) and insulin resistance (HOMA-IR). Participants were stratified into tertiles based on low, median and high baseline serum BPA levels. Regression models were used to analyze the relationship between serum BPA concentration and the incidence of T2D. BPA is not associated with a 5-year T2D incidence. These data do not support previous cross-sectional study that BPA exerted a detrimental effect on glucose metabolism. Xiaoyu Shu and Siying Tang are co-first authors. The authors thank Laboratory of Endocrine and the Laboratory of Lipid & Glucose Metabolism, the First Affiliated Hospital of Chongqing Medical University. Xiaoyu Shu and Siying Tang designed the study, oversaw the data collection and wrote the manuscript. Chuan Peng and Rufei Gao conducted the data analysis and contributed to the writing of the manuscript. Shumin Yang, Ting Luo and Yue Wang contributed to the study design and provided statistical expertise. Qingfeng Cheng contributed to the writing of the manuscript. Zhihong Wang assisted with the data collection and contributed to the writing and editing of the manuscript. Qianna Zhen contributed to the writing of the manuscript. Jinbo Hu and Qifu Li are the guarantor of this work and, as such, had full access to all the data in the study and takes responsibility for the integrity of the data and the accuracy of the data analysis. National key research & development plan, major project of precision medicine research (2017YFC0909600, sub-project: 2017YFC0909602, 2017YFC0909603). National Key Clinical Specialties Construction Program of China to the Department of Endocrinology, the First Affiliated Hospital of Chongqing Medical University; and the National Natural Science Foundation of China (81370954, 81670785) to Qifu Li; and the Fundamental Science & Advanced Technology Research of Chongqing (Major Project, cstc2015jcyjBX0096) to Qifu Li. Chongqing Science and Technology Committee Innovation Project (Technology Development and Application of Precision Medicine, cstc2016shms-ztzx1003) to Qifu Li. All human studies have been reviewed by the committee and have been performed in accordance with the ethical standards laid down in an appropriate version of the 1964 Declaration of Helsinki. All participants gave their informed consent prior to their inclusion in the study.